Needham Chalks (HAM) Ltd supplies a number of industrial chalk based products for many situations. With the ability to grind chalk, we are able to produce a range of products to be used in a number of different applications all made to specification ISO 9001:2000. Needham Chalks have been supplying chalk to UK brick manufacturers for more than 30 years. At our current Barton Mills facility we produce over 20,000 tonnes of fine milled chalk all in the sub one mm range. The chalk is mixed in with the brick clay which on firing will give a yellow brick with excellent frost resistance. Brick chalk is available in several grades of fineness to suit particular requirements. All is made the the specification ISO 9001:2000. Needham Chalks Environmental Chalk is a screened granular chalk, typically in the 10 to 20mm size range. which has been developed to meet a growing market for the absorption of environmentally harmful components of flue gas emanating from power stations brick works and other industrial processes. In simple terms the chalk is put into trays which form part of the flue structure. Flue gases pass through the porous structure of the chalk and the harmful components are absorbed in to the chalk which will ultimately becomes saturated with contaminant and has to be replaced from time to time. The net effect is that atmospheric emissions are much improved. Given the very absorbent nature of East Anglian chalk it is possible to achieve considerable emissions improvements in some applications whereby powdered chalk is mixed in with the combustion fuel, such as biomass, to absorb harmful gaseous components at the grate rather than in the flue. Using this method the contaminated chalk simply becomes part of the ash stream. SILTEX is a natural and inexpensive way to reduce organic silt and improve water quality in both lakes and rivers, in private and public waterways. It is environmentally friendly and harmless to plants and animals, and because it recycles organic material, it is of great benefit to the aquatic ecosystem. SILTEX also stimulates the aquatic food chain and helps to increase biodiversity. For supplies of SILTEX please contact AJS Fisheries. Many of Britain’s historic buildings were built with lime mortar containing small rounded chalk pebbles. To meet a demand from builders involved in the restoration of these buildings, Needham Chalks have come up with Heritage Mortar which is produced at our Castle Acre Quarry in Norfolk. The chalk from this quarry has been found to be well-suited to this application. Heritage Mortar Chalk is available in 25kg and 1 tonne bulk bags. Needham Chalks Line marking is a safe and environmentally friendly way of marking out sports playing fields and grass courts. There are no binders or other chemical additives in our Line Marking chalk which is simply mixed with water to form a slurry which then be applied by most standard line marking machines. From a Health and Safety standpoint our line marking chalk is extremely safe to use, there being no special handling requirements. 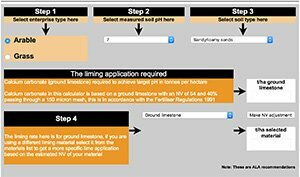 Line Marking chalk is available in 25kg polythene sacks which can be purchased directly from us in any quantity from one bag upwards. We can also quote for delivery. Needham Chalks supply garden Lime to gardens across the country to use as a neutralising agent. Needham Garden Lime is ground so that 100% passes through a 1mm sieve ensuring a superb quality and mode of action. Needham Chalks Garden Lime will effectively neutralise soil acidity and provide essential calcium for healthy plant growth. To purchase any of these products, or for more information please contact the office on the 01449 720227. 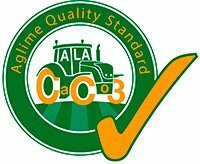 All sites registered with and pass Ag Quality Standards.